This card is often misunderstood. Let’s review how it works: If you play this on a Character, you can Destroy it in response to that Character being Attacked to reduce the amount of Attack Damage it receives. If a Fan is Destroyed when it’s used, it reduces the Damage by 2 instead of 1. 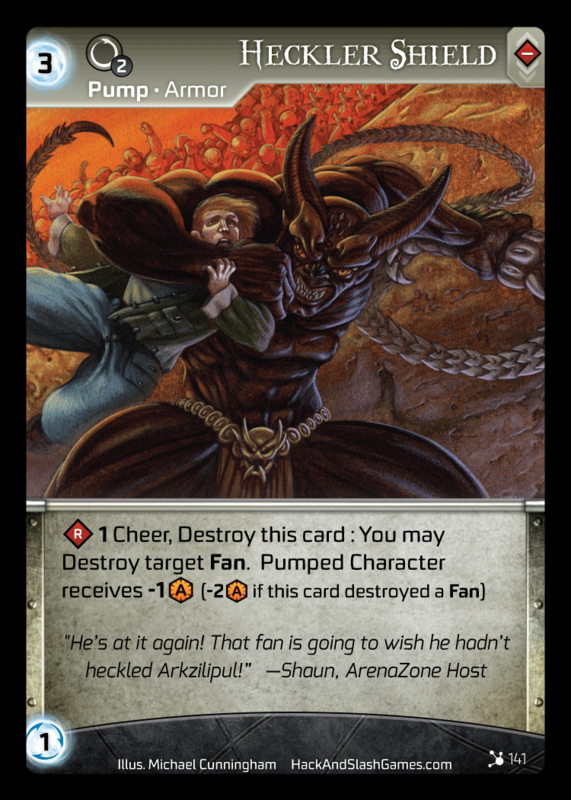 With only one Fan in the game, this card will only get better with the future release of additional Fans… but for now, it’s still a Universal way to protect your Gladiators. The fact that it can be your Fan or an opponent’s is a nice surprise as well! The Armor keyword will also become more useful over time. Spending Cheer is not always appealing, but if it can keep a Gladiator alive, it’s probably worth it! “Target receives -1 <ADMG>” = When taking Attack Damage, the target takes 1 less Attack Damage. “Target is -1 <ADMG>” = Reduce the printed Attack Damage on the target by 1.